Field Sport UK Activity Centre01283 763350work Outdoor Pursuits CentreWith a growing number of activities, Field Sport UK situated in the Midlands on the Derbyshire and Leicestershire border, pride ourself on delivering our activities in a fun, non rushed approach. We cater for corporate team building days, childrens birthday parties, hen and stag activity parties, family get togthers, in other words anyone who wants to have fun and enjoy a great outdoors activity experience! 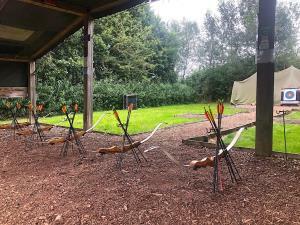 Some of our activities include, clay pigeon shooting using a tradional or pump action shotguns, archery, air rifle, pistol shooting and also back to nature bushcraft activities like, shelter building, fire craft and even game butchery, all delivered by experienced instructors that love what they do! It's never a problem to tailor any of our activities or packages to suit your requirements. With a growing number of activities, Field Sport UK situated in the Midlands on the Derbyshire and Leicestershire border, pride ourself on delivering our activities in a fun, non rushed approach. We cater for corporate team building days, childrens birthday parties, hen and stag activity parties, family get togthers, in other words anyone who wants to have fun and enjoy a great outdoors activity experience! Easily accessible from Birmingham, Leicester, Coventry, Nottingham, Sutton Coldfield, Derby, Tamworth, Burton Upon Trent, Atherstone, Nuneaton, Coalville, Rugeley, Rugby, Hinckley, Loughborough, Stoke, Sheffield and Swadlincote.